It's Electric! is now available as a groovy SINGLE BOX! Groove on over to the Groovy Lab in a Box website to do the "E" in STEM! 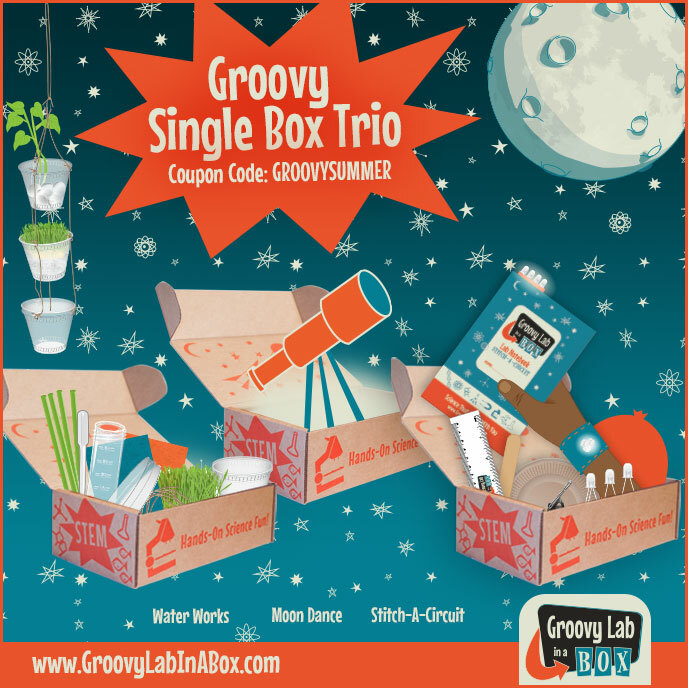 Groovy Lab in a Box is hands-on STEM, project based learning made FUN where ?STEMists? do the "E" in ?STEM?! Engineering Design Challenge in every groovy box! Investigate static electricity, origin and structure of the atom, paper circuits, switches, a groovy door alarm to keep any trespassers out of your room and much, much more!The Engineering Design Challenge: You are a groovy electrical engineer who has been contracted by the latest groovy dance group. Using only the materials from your Groovy Lab in a Box, can you design and build a groovy dance pad with specific criteria and constraints? Explore various science and engineering practices aligned with the Next Generation Science Standards. .
Don't forget: Every Groovy Lab in a Box comes with a groovy, retro-themed Lab Notebook where STEMists will take notes, draw pictures, redesign their engineering projects and apply their critical thinking skills. Plus, all groovy STEMists get access to the Beyond...in a Box web portal for additional groovy learning and STEM fun!